The course focuses on C# program structure, language syntax, and implementation detailswith .NET Framework 4.0. This course describes the new enhancements in the C# 4.0 language by using Visual Studio 2012. In this course, lower-intermediate level programmers gain the knowledge and skills they need to develop C# applications for the Microsoft .NET Framework 4.0. The course highlights the structure of C# 4.0 programs, language syntax, and implementation details. This course is not mapped to any exam. This module explains the .NET Framework, and using C# and Visual Studio 2012 for building .NET Framework applications. 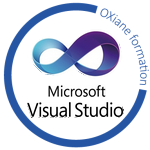 Create Microsoft Visual C# projects by using Visual Studio 2012. Explain the purpose of the .NET Framework, and understand how to use C# and Visual Studio 2012 to build .NET Framework applications.